A no-fail Indian butter chicken recipe that is sure to please. The magical combo of butter, tomatoes, yoghurt, cream and spices will make you reach out for more! Whisk together the marinade ingredients and put the chicken pieces in it. Cover and refrigerate for 4-5 hours. Transfer the marinated chicken to a baking tray and bake at 400 Fahrenheit for 45 minutes to 1 hour. While the chicken is cooking in the oven, prepare the gravy. Melt butter in a dutch oven and add whole spices. When the spices turn golden, stir in the onion and ginger-garlic pastes. Sauté for 5 minutes on high and then add the tomato paste. Tip in the Kashmiri chilli powder, salt and sugar. Cover and simmer for 15 minutes. Check once and add half a cup of water if the tomato gravy is too thick. When the gravy is done, add the chicken along with any scrapings and liquid from the baking tray. Cook for 5 minutes, then stir in the cream. Simmer for another 5 minutes. 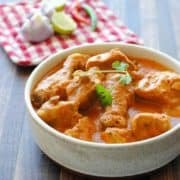 I am a huge fan of homemade, wholewheat rotis, but this particular indian butter chicken recipe calls for heavier breads like naan and tandoori roti. The humble roti just won’t do in this case, so go for the naan! You can add pureed tomatoes instead of the store-bought tomato paste if you so wish. Choose the reddest tomatoes you can find for a pleasing rich coloured gravy and whiz in a blender. Six medium sized ones will do.